Ashley Andreas was spoiling for a fight. 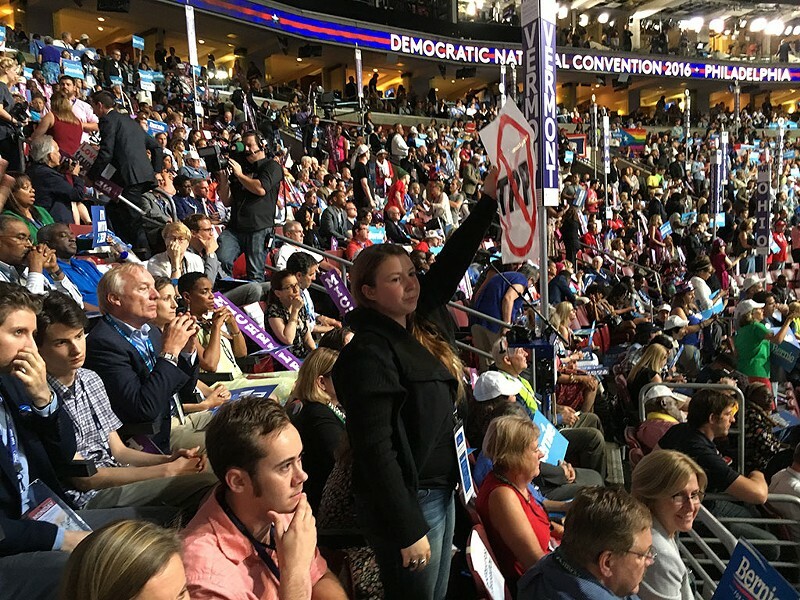 As she nursed an iced coffee Monday afternoon at the Pennsylvania Convention Center, the 23-year-old Wilder resident expressed hope that Democratic National Committee chair Debbie Wasserman Schultz would speak that night to kick off the party's convention. "We'd love to have her," Andreas said, an almost menacing tone creeping into her otherwise sweet voice. "We'd love to have her." To Andreas and her fellow Sen. Bernie Sanders (I-Vt.) devotees, Wasserman Schultz had come to symbolize everything they despised about the Democratic Party. And last Friday's embarrassing leak of internal DNC emails only added credence to their long-held view that the system was rigged for Hillary Clinton — and that the party chair was doing the rigging. "I'm not going to start a boo," Andreas said of a hypothetical Wasserman Schultz address. "But if there's a boo happening, I will join the boo." There was a boo, but it wasn't for Wasserman Schultz. Andreas, a Community College of Vermont employee and a pledged delegate to the Sanders campaign, hurried down the hall to a crowded concourse in the convention center in downtown Philadelphia. There, Sanders delegates were gathering for one final rally before the convention gaveled in that night. They did not sound like a retreating army. Decked out in Sanders schwag, the group chanted slogans that had resonated from Iowa town hall meetings to California sports arenas. "Feel the Bern!" they shouted. "Feel the Bern!" Sanders sought to calm the mob he'd spent more than a year inciting. Together, he said, they had launched a movement that had pushed the party to the left — and begun the process of reforming its presidential nominating rules. "Make no mistake about it," he said. "We have made history." But when Sanders urged the riled masses to "defeat Donald Trump" and throw their support behind Clinton and her vice presidential pick, Sen. Tim Kaine (D-Va.), the crowd erupted in a chorus of boos. "Brothers and sisters," he said, trying in vain to make himself heard. "Brothers and sisters, this is — this is the real world that we live in. Trump is a bully and a demagogue." Real world or not, these delegates had only one nominee in mind. "We want Bernie!" they chanted. "We want Bernie!" "Trump is a danger for the future of the country and must be defeated," Sanders continued, his voice growing louder. "And I intend to do everything I can to see that he gets defeated!" If that means muting the "Bernie or Bust" crowd, the senator from Vermont clearly had some work to do. Outside the convention center, Sanders campaign manager Jeff Weaver downplayed the divisions as he waited for a ride across town to the Wells Fargo Center. "I think people, in the end, will realize the danger Trump poses," Weaver argued as he stood on a Center City street corner in sweltering heat and humidity. "I expect all of our delegates to handle themselves with decorum inside the Wells Fargo Center." Before Wasserman Schultz's replacement could even gavel it in, Congresswoman Marcia Fudge (D-Ohio) was interrupted by the very same boos that Sanders had encountered hours earlier. "We are all Democrats, and we need to act like it," Fudge responded. 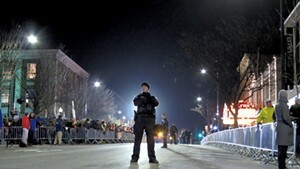 But the jeers continued into the evening. When Congressman Elijah Cummings (D-Md.) called the Democrats "a party of unity — and not division," Sanders supporters responded in force. "No T-P-P!" they chanted, referring to the proposed Trans-Pacific Partnership trade agreement. As convention organizers sought to quell the insurrection, Sanders himself sent an email to delegates imploring them to restrain themselves. "Our credibility as a movement will be damaged by booing, turning of backs, walking out or other similar displays," he wrote. In a section of seats reserved for the Vermont delegation, Brian Pine bemoaned the lingering hard feelings. "Bernie does not want that," he said. "Bernie knows what it's like to be on the winning and the losing side." Pine, a former housing director for the City of Burlington, could speak with some authority. He first encountered Sanders in 1981 when, as a freshman at the University of Vermont, he heard the then-mayor speak at an Arlo Guthrie concert at the Flynn Center for the Performing Arts. "I turned to the person next to me and said, 'Who is this guy?'" Pine recalled Monday. Within months, he had joined what would one day be known as the political revolution. By 1986, he was driving Sanders from St. Johnsbury to Brattleboro as the mayor challenged governor Madeleine Kunin for the state's top job. Sanders would win just 14 percent of the vote — a dismal showing, but far better than his four previous bids for statewide office. "I never thought that he'd run for president," Pine said. "I did think he'd be our governor one day." Now Pine found himself serving as an elected delegate for his onetime boss. Around him sat the rest of Vermont's delegation — the vast majority of whom planned to vote for Sanders. Superdelegate Billi Gosh, a national committee member from Brookfield, coined a term for the group's Clinton supporters: "Billi and the boys." The boys, she explained, were Sen. Patrick Leahy (D-Vt.), Gov. Peter Shumlin and former governor Howard Dean. The state's other superdelegates — including Congressman Peter Welch (D-Vt.), Secretary of State Jim Condos, party chair Dottie Deans and vice chair Tim Jerman — had pledged their support to Sanders. Jerman, a state representative from Essex Junction, said he empathized with those in the "Bernie or Bust" crowd. "I do get that they don't want to just hear the Donald Trump argument — that it's deeper than that," he said. But he added that he was surprised and disappointed at "some of the vitriol and the anger" being displayed. Andreas, who is running for the Vermont House in her Upper Valley district, tried to keep her own anger in check. But as she waited for Sanders to speak, she said she would have a hard time casting a ballot for Clinton — at this week's convention and in November. "I gave her a really fair chance. We all did," Andreas said, criticizing Clinton's resistance to enshrining her newfound opposition to the TPP in the Democratic platform. "This is the opposite of how you unify a party. She does not want unity. She wants to, in a dictator style, take over this convention and the Democratic Party — and that's not unity." The Wilder resident said she was "disgusted" that convention organizers had staged "a Hillary love fest," assuming Clinton would defeat Sanders during Tuesday's roll-call vote. An inclusive convention, she argued, would feature speeches from Sanders supporters, too. When Seven Days noted that many such supporters — including Sen. Jeff Merkley (D-Ore.), Congressman Keith Ellison (D-Minn.) and comedian Sarah Silverman — had, in fact, spoken that night, Andreas sounded unimpressed. "Yeah, but every single one of them said to vote for Hillary Clinton," she said. Chief among them was Sanders himself. After Sen. Cory Booker (D-N.J.), Sen. Elizabeth Warren (D-Mass.) and First Lady Michelle Obama wowed the crowd, Sanders emerged to rapturous applause. After a number of failed attempts to quiet the crowd, the second-place finisher got down to business. "I understand that many people here in this convention hall and around the country are disappointed about the final results of the nominating process," he said. "I think it's fair to say that no one is more disappointed than I. But to all of our supporters, here and around the country, I hope you take enormous pride in the historical accomplishments we have achieved." The Vermont delegation signaled its approval. Its youngest members, 18-year-old South Burlington student Aster O'Leary and 25-year-old Hartford High School teacher Noah Detzer, jumped to their feet. Sanders left little doubt about what he wanted his supporters to do. "Any objective observer will conclude that, based on her ideas and her leadership, Hillary Clinton must become the next president of the United States," Sanders said, arguing that she would do an "outstanding" job. But even as her hero spoke, Andreas continued her protest. She stood quietly and, with her left hand, held a white sign with the letters "TPP" crossed out. "No," she said the next morning when asked whether Sanders had persuaded her. "He gave Hillary Clinton credit for talking the talk, but I still haven't seen her walk the walk." Andreas was sitting at breakfast with her fellow Vermont delegates at a Wyndham Garden Hotel near Philadelphia International Airport. As they dined on pancakes and eggs, they listened to former governor Dean argue that Clinton would take on Wall Street. During a question-and-answer period, Andreas stood up and challenged the former governor. "Isn't it conflicting — the amount of money that she's taken from those banks?" she asked. Dean, himself a onetime progressive icon, defended Clinton's record and made the case that change does not come overnight. "Look, I said before, this is a game of inches, not miles," he told Andreas. "We don't get everything we want all at once, no matter where we are." That night at the Wells Fargo Center, Congresswoman Tulsi Gabbard (D-Hawaii) — a former vice chair of the DNC and one of Sanders' most prominent supporters — moved to nominate her candidate. "Because this is a movement fueled by love, it can never be stopped or defeated," she said. Among those seconding his nomination was classical singer Shyla Nelson — a Vermonter and a Sanders delegate. "I am so proud of Bernie," she told the crowd. "We will never stop working for a future we believe in. We will never stop fighting for the change we need. And we will never forget the man who leads us." One by one, state and territorial delegations took turns announcing who had won their votes. They hailed Clinton as the next — and first female — president and saluted Sanders for his hard-fought candidacy. In a poignant moment, the senator's older brother, United Kingdom politician Larry Sanders, spoke for the Democrats Abroad delegation. Tearing up, he invoked the names of their deceased parents. When Vermont's turn came, O'Leary took the microphone and said that the Green Mountain State would pass — for now. Moments later, Sanders and his wife, Jane O'Meara Sanders, emerged from a passageway and joined their state's delegation. 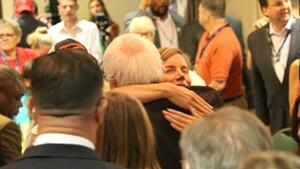 They hugged old friends and took seats on either side of Deans, the Vermont Democratic Party chair. After every other state had spoken, Deans rose and declared that Vermont would send 22 votes "to our beloved Sen. Sanders" and four to Clinton. Then she turned over the microphone to the candidate himself. He waved his left hand at the crowd in a long, sweeping arc. Behind him, Andreas stood at attention and held a Sanders sign in the air. "I move that all votes — all votes cast by delegates — be reflected in the official record," Sanders said. "And I move that Hillary Clinton be selected as the nominee of the Democratic Party for president of the United States." He put the microphone back on its stand, kissed and hugged his wife, waved to the crowd and walked out of the arena. 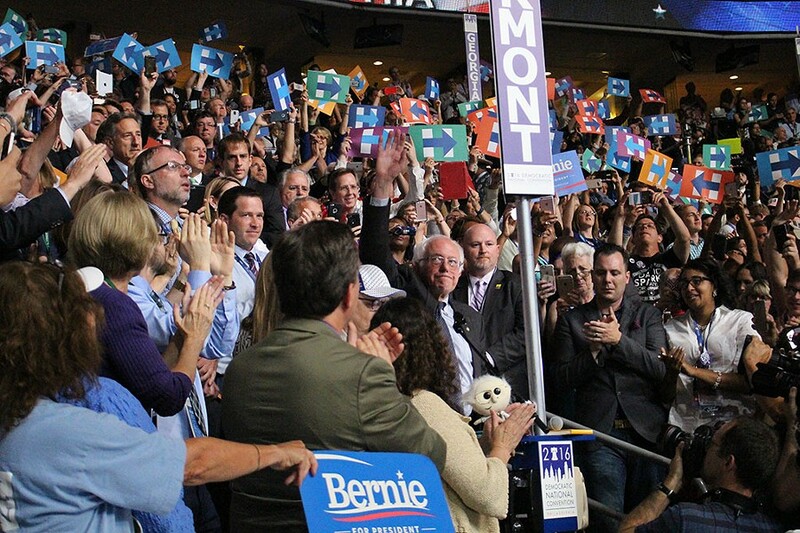 Behind him, Democratic delegates went wild — celebrating the presidential nomination of a former first lady, senator and secretary of state. Even Vermont's Sanders-loving delegates smiled and danced as Pharrell Williams' "Happy" played over the PA. But not Andreas, who looked glum and at a loss for words. In the hallway outside, her fellow Bernie or Bust-ers marched toward the exit. "Locked out! Walk out!" they chanted. "Locked out! Walk out!"